Where do you prefer staying when you go on vacation? I love first class hotels!! I enjoy camping in the great outdoors. I always look for vacation rental homes in the area. It doesnʻt matter, I pick whatever is the cheapest. 2) If you do, then how do you get a permit and where can you camp? Oʻahu is where I live now. Itʻs a simply gorgeous island with "to die for" weather, fantastic beaches, and special pockets of outdoor beauty that will make you forget that youʻre only fifteen minutes from a grocery store nearly everywhere on the island. It only takes about four hours to drive around the main part of the island, and thatʻs counting brief camera stops along the way. Because Oʻahu is where most tourists spend the majority of their time, weʻve become an urban island setting. There are almost a million residents living here year round, and tourists arrive and leave throughout the year. Honolulu and Waikiki are full of tall buildings and traffic jams. But there are still places that are hidden gems youʻll get to know better if you camp out. 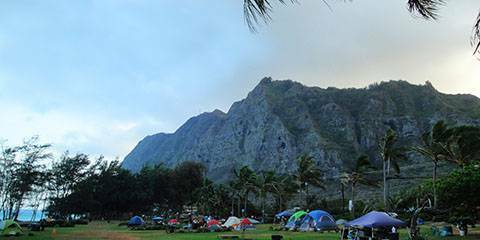 There are special rules for camping on Oʻahu. These rules have evolved because of the need to keep our parks and campgrounds clean, our campers safe, and avoid having those who are "homeless/houseless" living longterm at public campsites. My husband and I love to camp. Itʻs a great way to decompress from busy weekday schedules and to unplug from our "devices" that claim so much of our precious time. Food always tastes better when cooked outdoors, the birds begin singing before dawn, and even the sun seems to shine brighter on campouts. The City and County of Honolulu is the government responsible for the whole island of O'ahu. 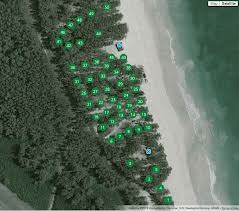 They have a good website and online camping system that makes available 225 campsites at 17 campgrounds on the island. You can now reserve a campsite from your home computer or even your cell phone. There are 4 campgrounds that have to be reserved through the State of Hawaii system. Click here to reserve a state campsite. This is the tricky part if youʻre visiting Oʻahu. With baggage fees now commonplace on all domestic flights from the mainland, and most international flights as well, it doesnʻt make sense to pack heavy equipment. So that means youʻre going to have to get your gear here in Hawaiʻi. Iʻve known people who have bought what they needed once they landed in Honolulu. Our weather here is mild most of the time unless weʻre having a rainy period (more common October to March). WalMart has 2-person tents and most of what youʻll need including inexpensive boogie boards, snorkels, fishing equipment and cookware. Thereʻs also a good thrift store called Savers where you might find used camping supplies. But remember, whatever you buy youʻll have to donate back to a non-profit (Savers is a non-profit) or someone you meet during your stay. Otherwise, youʻll have those extra baggage fees on your flight home. Sorry, I don't have reliable information on places that rent outdoor equipment. If you're a backpacker and know how to efficiently pack and carry what you'll need, O'ahu has an excellent public transportation system on the island called The Bus (donʻt say weʻre not creative with our names here). Our buses can get you just about anywhere you want to go for $2.50 one way but they arenʻt designed to accept passengers with lots of equipment or luggage. They can accept passengers with bicycles as long as the rack on the front of the bus is empty. This is a huge thrift store near downtown Honolulu where you might find used camping and cooking supplies. Walmart is...a Walmart. What more can I say? 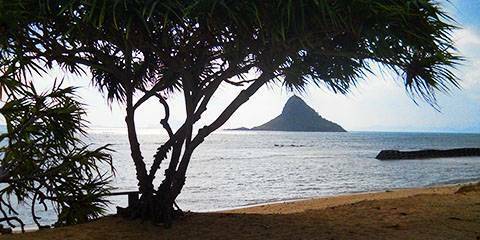 There are 21 campgrounds on the Island of Oʻahu. Some of them are run by the State of Hawaiʻi; others are run by the City and County of Honolulu. Other than the contact information and where to get your permit, you wonʻt notice any difference at the individual campsites themselves. There are no Kampgrounds of America (KOA) in Hawai'i. State and county campgrounds don't have facilities or hookups that allow for RVʻs or trailers, and you canʻt sleep in vehicles in the campground parking lots. 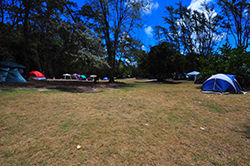 The Malaekahana Beach Campground, operated by a private firm, allows vehicle camping. There are two separate campgrounds at Malaekahana on the North Shore. 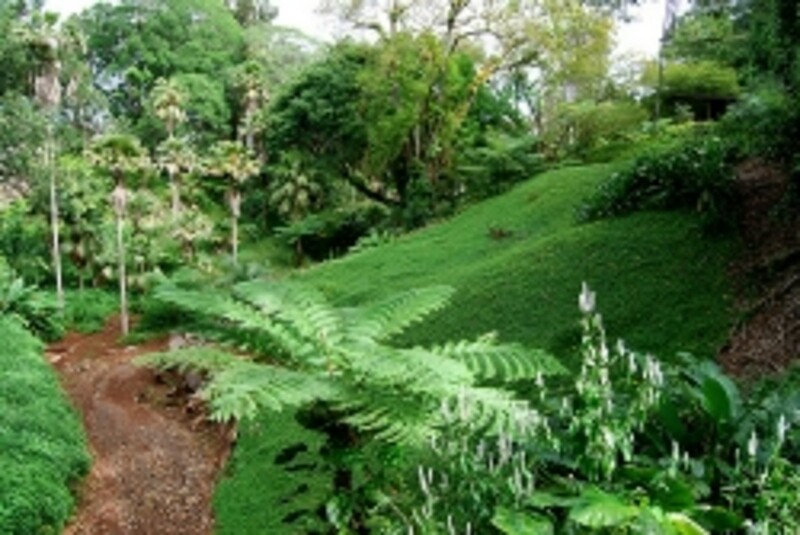 Both are located between the towns of Laʻie and Kahuku about 45 minutes from downtown Honolulu. One is run by the State of Hawaiʻi and the other is operated by a private company called Malaekahana Beach Campground LLC. We usually stay at the state campground because itʻs a little quieter, well maintained and not as crowded on the weekends weʻve chosen to go. And they have warm water showers and a clean bathroom (high on my priorities!). 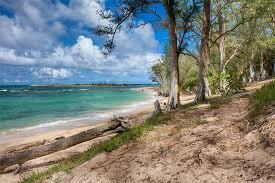 But we've heard good things about the Malaekahana Beach Campground and can't wait to camp there as soon as we can. They also have facilities that can be rented out for larger groups. The ocean is ideal for swimming, snorkeling and boogie boarding. The white sand beach is great for jogging or relaxing. This side of the island gets morning sun, so if you wake up early enough youʻll enjoy the awesome sunrises. Nearby activities and services are Kahukuʻs popular roadside shrimp trucks, hospital & ER at Kahuku Medical Center, Polynesian Cultural Center in Laʻie, Mormon Temple in Laʻie, Laʻie Shopping Center including a Foodland grocery store, movie theater, ice cream shop and fast food restaurants. Brigham Young University (BYU) Hawaiʻi is located in Laʻie. During high surf season in November and December, surfing competitions on the North Shore cause busier traffic in the area. On another note, due to the predominantly Mormon population in Laʻie and Kahuku, most public businesses in Laʻie are closed on Sundays including the grocery store. If you happen to be here during football season, the home games for the Kahuku High Red Raiders are a community event you wonʻt want to miss. Operated by the State of Hawaiʻi, there is often an onsite manager available. Cost for non-residents is $18 per night for up to 6 people for a campsite; add $3 for each additional person. Children under 2 are free. Residents pay $12 a night, with $2 additional per person over 6 campers. There are 37 tent campsites. Only one campsite reservation per permittee, and rentals for commercial uses are not allowed. Reservations are accepted no more than 30 days in advance; payment in full at time of reservation. No mail-in reservations allowed. You can rent a campsite for up to 5 days beginning on Fridays and ending on Wednesday. There is no camping allowed on Wednesdays and Thursdays. The gate to the campsite area opens at 7am daily and closes at 6:45pm and an hour later during the summer. To reserve a campsite and pay, click here. Tutu's Hale Pavilion is a small village setting that can accommodate up to 20 people. There is dedicated space for vehicle camping. 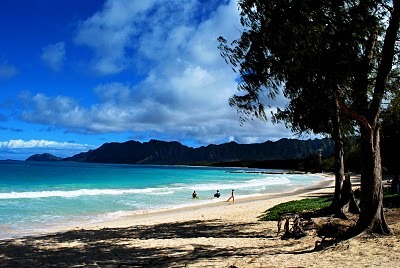 Located about a mile north of the state-operated campground is privately-run Malaekahana Beach Campground. This campground offers a variety of different camping facilities, SUP, kayak and board rentals, a camp store to keep you stocked up, and an on-site food truck for easy eating. This campground has 74 campsites including a host of shelter choices. Some of the choices include tent campsites with a campfire ring and access to outdoor toilet and shower for $10 per night per person. A dedicated vehicle camping area with access to outdoor toilet and shower is available for $10 per night per person. If you don't want to sleep in a tent or vehicle, the 100 square foot wooden plantation "hale's" (houses) sleep up to 4 people but have no electricity or plumbing for $60 a night. Plantation Suites are small homes (480 sq ft) that sleep up to 4 with a 128 sq ft lanai, electricity and indoor bathroom, queen size bed, bunk bed set, lockable door. All for $118 a night. Tutu's Hale Pavilion is for large groups. It's actually a small village with 5 small hale's nestled close together with a generous sized pavilion for communal gatherings, perfect for family reunions, weddings, or parties. Accommodates up to 20 guests with access to your own toilet and shower facilities. Group rate is $388 a night. Campground has onsite staff who monitor the site 24 hours a day. Gate to campground is locked from 7pm to 7am. 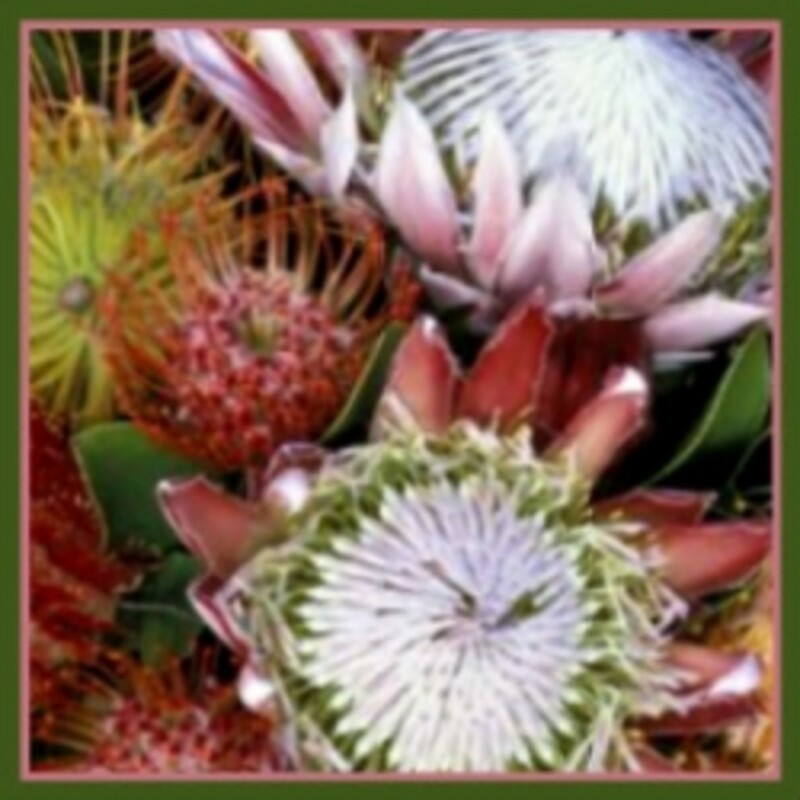 To check availability of facilities and to make reservations, click here. This is, by far, one of the most popular family beach sites on the island. 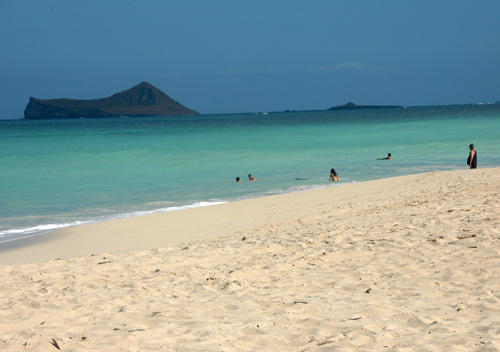 "Bellows Beach" in Waimanalo is on the windward side of Oʻahu and part of Bellows Air Force Base. It is only open for public camping on the weekends beginning on Friday at noon through Sunday, and the 50 tent campsites book up fast. During the week, the military uses it as a military training area, and there are certain weeks throughout the year when it is closed to the public for military use only. The ocean in this area is a beautiful aquamarine color and great for swimming, boogie boarding and kayaking. Sunrises are amazing here and itʻs always soothing to know that youʻre away from the hustle and bustle of Honolulu 30 minutes distant. The white sand stretches on for what seems like miles, and youʻll have no trouble carving out a piece for beach volleyball or frisbee throwing. The gate to the campground is closed each night between 8pm and 6am. Onsite amenities include two comfort stations and outdoor showers. There are cooking stands and picnic tables throughout the campground. Lifeguards are present during daylight hours. You can reserve a campsite up to two weeks in advance. The cost for the three-day camping permit which will cover up to 10 people at one campsite is $32. Only cars with parking permits will be allowed to park overnight, and you need to provide the make, model, color, year and license plate number for up to 3 permitted cars. 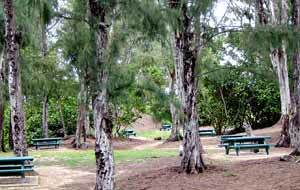 To reserve a campsite at Bellows Field Beach Park, click here. There are no refunds. There is another area of Bellows that has beachside cottages available for rent by active duty military and their dependents. If youʻre interested in that, call (808) 259-8080. 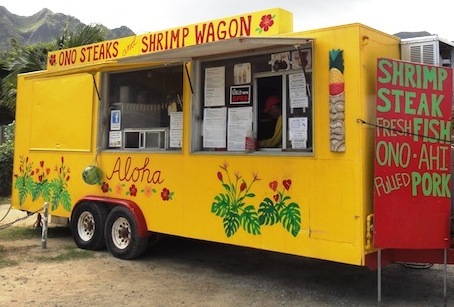 The Ono Steaks Shrimp Wagon is a bright yellow lunch wagon that is usually parked by the Naturally Hawaiian Gallery, but you can't miss it on the main strip of Kalanianaole Hwy. as you drive through Waimanalo. Their lunch plates are "da bomb". Their specialty is Garlic Shrimp but my favorite is their Coconut Shrimp. They've been featured on the Cooking Channel's Unique Eats, Food Network's Beach Eats, and on the Travel Channel. 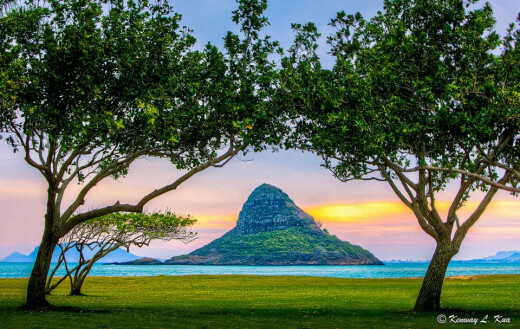 You can get a full view of Chinaman's Hat from Campground B at Kualoa Regional Park. Kualoa is such a beautiful area on the edge of Kaneʻohe Bay. It has a lot of cultural significance to Native Hawaiians, but weʻll leave those stories for another day. There are two separate campsites in this park: Campground A and B. The security gate to Kualoa Park closes at 8pm and reopens at 7am. Campground A has seven campsites including an ADA accessible campsite, a comfort station and outdoor showers. Itʻs on the side of the park with calm ocean waters perfect for paddle boarding or kayaking. You also get awesome views of the Koʻolau Mountain range. Campground A is usually closed during summer months for special youth and parks programs. Camping permits are for three days.There is no camping on Wednesday or Thursday. Cost is $32 for a 3 day permit for a campsite holding up to 10 people. To check availability and reserve a campsite for Campground A, click here. To arrange for use of the beach wheelchair while youʻre here, call (808) 237-8525. Campground B has 14 campsites including two ADA accessible campsites, a comfort station and outdoor showers. This is on the side of the park with a full-on view of Mokoliʻi Island, popularly called Chinamanʻs Hat. The ocean is pretty calm for swimming. You can also swim, paddle or kayak to Mokoliʻi, but donʻt try it unless you are a good ocean swimmer. There are ancient Hawaiian fishponds in the area and you can fish here. 5 day permits are $52 for a 10 person campsite and you can call to reserve the beach wheelchair. To check availability and reserve a campsite for Campground B, click here. There are no major shopping centers in the vicinity of Kualoa Park, but there are a few small stores and a 7-11 a bit up the road, so plan accordingly. Kualoa Ranch takes up most of the surrounding land area, and you can spend a delightful day there. Itʻs a 4,000 acre working cattle ranch but is also an area attraction with onsite restaurants that serve grass-fed beef, a gift shop, petting zoo, horseback and ATV riding, and much more. Many TV shows and movies have filmed at Kualoa Ranch, including Jurassic Park, Pearl Harbor, Hawaii 5-0 and 50 First Dates. a pleasure , a temptation, thank you Stephanie. Awesome Hub! Thanks for Sharing!